wdnicolson.com - An NRL Blog: The 2012 NSC Rugby League Almanac is now available. The 2012 NSC Rugby League Almanac is now available. THE 2012 RUGBY LEAGUE ALMANAC HAS ARRIVED! 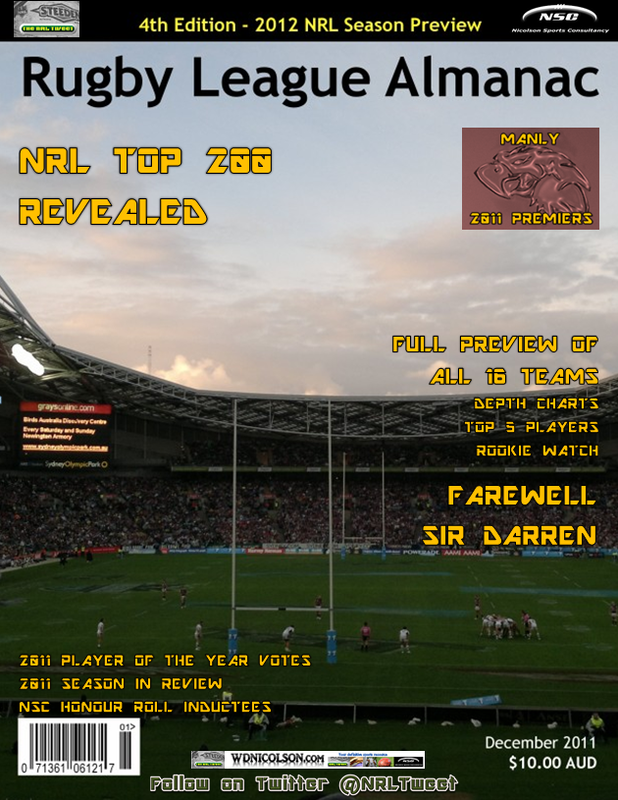 After months of hard work, the 4th Edition of the NSC Rugby League Almanac is now available to purchase here. For just $10.00 AUD the 49 Page Rugby League Guide will give you the most in depth analysis of the 2012 NRL Season on the market and has two special features that will stir up plenty of debate over the off-season. The long awaited NRL Top 200 is revealed - answering the question: If you could choose any player first overall to help you win a premiership in 2012 - who would it be? And the NSC Honour Roll returns after a 4 year hiatus with 15 new Inductees to the Exclusive List of Rugby League Greats to have played the game since 1989. Released Friday December 23, 2011. 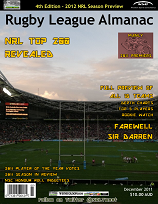 The 2012 NSC Rugby League Almanac is just $10.00 (AUD) and is a veritable NRLPalooza. 49 Printable A4 Pages of NRL Information - either in full A4 or Booklet Form. The long anticipated NRL Top 200 - Who would we pick 1st to win the comp in 2012? The NSC Honour Roll gets 15 new inductees as we recognise the Best in Rugby League since 1989. 2012 Season Preview - Team Synopsis, Expanded Team Depth Charts, Power Rankings, Top 5 Players, Top 3 Rookies, Best Lineup, Transaction Grading, Season Draw and Bold Prediction: Contender or Pretender? 2011 Club Review - incorporating full 2011 NRL Tweet Player of the Year Votes, Full Results and Awards. Best Photos of 2011 - the Screen Shots you shouldn't forget in a hurry. And what's in store from www.wdnicolson.com, The NRL Tweet and maybe NOT The Footy Show in 2012. If you purchase via PayPal, your email will be sent to wdn@wdnicolson.com confirming your payment and the Digital Product will be made available to you asap via an email link. If you would like to buy more than one copy at a time, then choose from the drop down menu above or if paying via Bank Transfer simply multiply the number of Almanacs you need by $10.00 AUD. The reason you should include your Email Address in the ID tag is so we can then identify that you have made a payment and your email address will be granted download access to the Digital Product you have purchased via a provided link. If you have any questions please email wdn@wdnicolson.com and please encourage others to buy a copy of the Almanac, we would appreciate you not forwarding on the Almanac freely as that disrespects the work that has gone into producing the document. Delivery of Digital Product is normally within two hours in between the hours of 9am and 7pm. If you purchase outside of these hours, the Digital Product may not be cleared for download until the next day but will be delivered as soon as possible. To purchase a copy other than via PayPal, please visit this page for deposit details.